This is a continuation of my Web A Neur Series – a series to help entrepreneurs leverage the web for their success, and other tips on starting a business. When it comes to website design theory, I’m typically influenced by the simplicity and “cleanliness” of the likes of Google. If you go to any of Google’s web property, you’ll find not only simplicity in design, but almost the absence of design and media – things like images and videos and links are nearly non-existent, YouTube being the exception of course. But I want to encourage you, with your own website, to not be afraid of building a media rich site for your own customers, readers, and visitors. The internet is getting faster. Today, residential cable internet customers in the U.S. can generate up to 20MB’s down load speeds, and commercial speeds can easily double or triple that. In places around the world like South Korea, where the internet is even more advanced and utilized than here in the U.S., data speeds are exponentially faster. Take a look at Coupang.com. 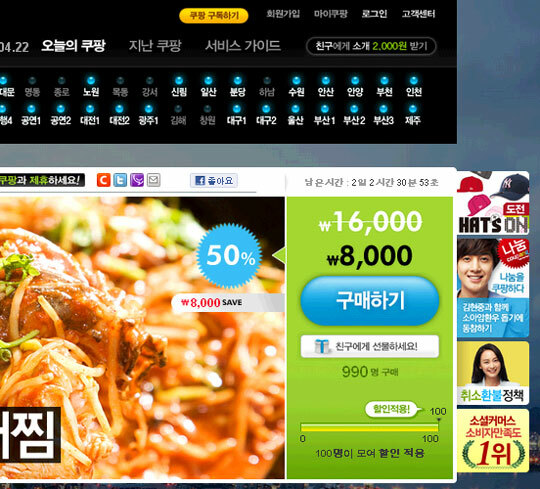 This is the #1 daily deal site in South Korea and is absolutely burying Groupon and other competitors. You’ll notice immediately with Coupang.com that it’s very busy, noisy, and full of rich media. But you know what – people love it, and seemingly can’t get enough of it. So my point here is to not be intimated by creating media rich sites. Lot’s of images, videos, and links can actually garner a much more engaging experience for your visitors and customers. I know it’s a bit of unconventional thinking because when you think of media rich sites, you typically think of the spam heavy sites of the late 90’s and early 2000’s. The internet is faster now for most people around the world. And web browsers themselves are exponentially faster by design – just look at Chrome. So be bold, be unconventional, and don’t be afraid to bring your site to life with a lot of rich media for your visitors and customers. You can easily create a lot of images and videos about your business by simply pulling out your iPhone of Android smartphone. And then simply upload that media to your site. Try it out – and let me know how it goes. I think you’ll be pleasantly surprised! Read more from my Web A Neur Series.